To understand how and why the Queen’s effigy is used throughout the world today, we must first look at the hierarchy of countries and territories of which Queen Elizabeth II is monarch. 3] The British Overseas Territories. The Queen also has a role as the Head of the Commonwealth. England and Scotland are kingdoms, Wales is a principality, whilst Northern Ireland is neither! There are Scots who object to Queen Elizabeth styling herself “the Second”, since only England, and not Scotland, had a Queen Elizabeth the First. 3] The Isle of Man. These are semi-autonomous, and although, just like the UK, they use the British pound sterling, they are allowed to issue their own local versions of the coins and banknotes. Guernsey also has its own dependencies: Alderney, Sark, and Herm – the others are either private (one is owned by the reclusive Barclay brothers) or tiny and uninhabited. Jersey and Guernsey and the dependencies are collectively known in Britain as the Channel Islands. These are British possessions and were formerly known as “colonies”, but that is not a politically correct term these days. These are those independent states of the Commonwealth that have chosen to retain the Queen as their head of state. They were formerly known as the Dominions, but that term is no longer politically correct. There are seven Australian external territories; two New Zealand dependent territories: the Ross Dependency (an uninhabited region of Antarctica) and Tokelau; and two New Zealand associated states: Niue, and the Cook Islands. The Queen is also monarch of these. It used to be the case, from 1936 onward, that there was a strict numismatic hierarchy in the Empire and Commonwealth, whereby the colonies and crown dependencies were required to use a crowned effigy of the monarch on their coinage, whilst the UK and the Dominions were allowed to depict the monarch uncrowned. This tradition fell into disuse with the creation of Arnold Machin’s famous effigy of the Queen in 1964: the Queen made it known that the effigy should be available to any country or territory that wanted to use it. Now to the modern usage of the Queen’s effigy on the coinage. It is a legal requirement that the portrait of the monarch should appear on the obverse of the coinage. This requirement has been followed without exception throughout the reign of QEII. In the case of Jersey and the Isle of Man, the monarch has always appeared on their coinage. However, did you know that the monarch did not appear as the regular obverse on Guernsey’s coins until 1985? Before 1985, the Guernsey coat of arms was used. From 1985 onwards, the Queen’s effigy is used, with a small version of the Guernsey arms to the left of her effigy. The Guernsey authorities made a deliberate decision to use the Queen’s effigy, in an attempt to make Guernsey’s coins more attractive to collectors. Alderney also issues coins bearing the Queen’s effigy, but these are collector coins only. Interestingly, when the latest effigy of the Queen (by Ian Rank Broadley) was adopted, the Guernsey arms were significantly reduced in size, and they do not even appear on Guernsey's circulation two pound coin. Of the British Overseas Territories, some use their own currencies, while some issue only collector coins. However, all of them that do so, or have done so, use the Queen’s effigy on their official issues. Anguilla briefly broke away from British rule in the late 1960s and issued its own unofficial coins, which did not portray the Queen but the island’s unofficial coat of arms. 1] The British Virgin Islands and The Turks and Caicos Islands use the U.S. dollar. The East Caribbean States are a currency union. * These separate pound currencies are pegged to the UK pound sterling at a rate of one to one. Although the Queen is the head of state of these countries, they are not obliged to use her effigy on their coinage: some do, some do not. 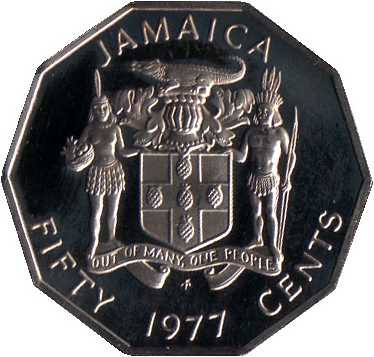 When I first saw the modern coins of Barbados and the Bahamas, I knew that they were members of the Commonwealth, but because the obverse of their coins carried their coat of arms and not a portrait of the Queen, I thought they must be republics. This is not the case, however. 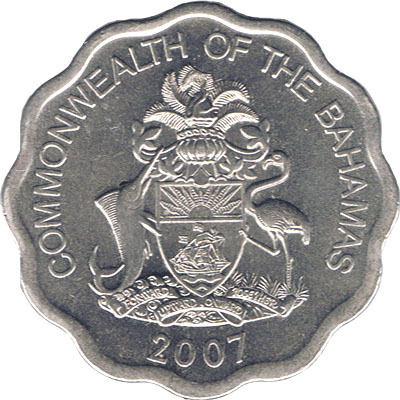 Of the Commonwealth Realms, the following do not carry an effigy of the Queen on their coins: The Bahamas, Barbados, Jamaica, and Papua New Guinea. 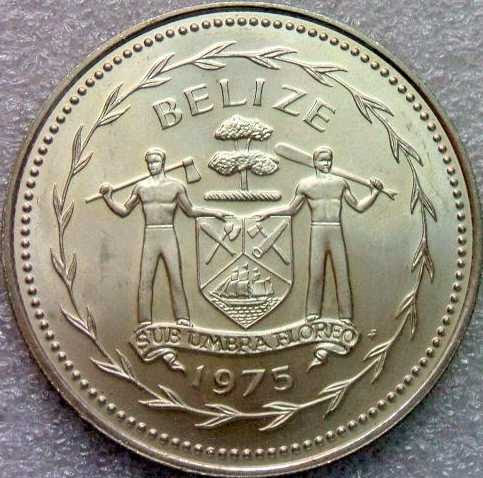 Belize uses the Queen’s effigy on its circulation coins, but in the 1970s and 1980s it issued collector coin sets that used its coat of arms on the obverse, while the reverses depicted exotic designs of local birds that did not appear on their circulation coins. These sets were designed and produced by the Franklin Mint and specifically aimed at collectors. Apart from Belize and Guyana, I know of no other country that has used one set of designs for its collectors and another set for its circulation coins. So far as I know, Belize is the last country in the world still using the old-fashioned crowned effigy of the Queen, created by Cecil Thomas, on its coins. Those members of the Commonwealth that are not Commonwealth Realms still have the right to portray the Queen on their coins in her capacity as the Head of the Commonwealth. In 1966, the Gambia used the Queen’s effigy on its circulation coins, even though the Gambia had by that time become a republic. Since 1971 it has used either a portrait of its president or its coat of arms on the obverse of its coins, and not an effigy of the Queen. Zambia has never used the Queen’s effigy on its circulation coins, but in recent years it has often used her portrait on its collector coins, usually in conjunction with its own coat of arms. You normally would not expect Dominica, as an independent republic, to use the Queen’s effigy on its coinage. However, since it is a member of the Commonwealth, and the Queen is the Head of the Commonwealth, it is entitled to do so, just as the Gambia and Zambia have done in the past. All the other members of the East Caribbean States have the Queen as their sovereign. Even in recent years, there have been new additions to the number of territories that issue coins carrying the Queen's effigy. Unfortunately, most of these have been non-circulating coins aimed at collectors, from uninhabited dependencies of Tristan da Cunha, such as Gough Island and Stoltenhoff Island. Although these particular coins are legal tender, such coins are not taken seriously in the hobby. Here is a list of countries and currency unions whose circulation coins have carried, or carry, an effigy of Queen Elizabeth II on their obverse. * These are currency unions, not countries. Here is a list of countries and territories that have only ever issued collector coins with an effigy of Queen Elizabeth II on their obverse. 1] They are issued by countries or territories that - with the exception in this list of BARBADOS - do not issue CIRCULATION coins and never have done. 2] Some of these issues, such as those from the Pitcairn Islands, are designed to convey the impression that they are a circulation set, when they never in fact circulate. The Pitcairn Islands, for instance, use the New Zealand dollar - not their own coins - and though these issues are theoretically legal tender, you are highly unlikely ever to see them circulate. 3] Some of these territories, for instance Gough Island, Nightingale Island, and Stoltenhoff Island, which belong to Tristan da Cunha, are UNINHABITED BY HUMANS - therefore there is no reason for coins to be issued in their name. 4] They are commercial products only, aimed at collectors of such items, and as such, SOME of them possess NO INTRINSIC NUMISMATIC VALUE. * Tristan da Cunha, a British overseas territory, has issued official collector sets in the name of three of its uninhabited islands: Gough Island, Nightingale Island and Stoltenhoff Island. These islands have no political sovereignty of their own; the sets do not circulate (only UK coinage is used on Tristan da Cunha) and are issues of Tristan da Cunha.